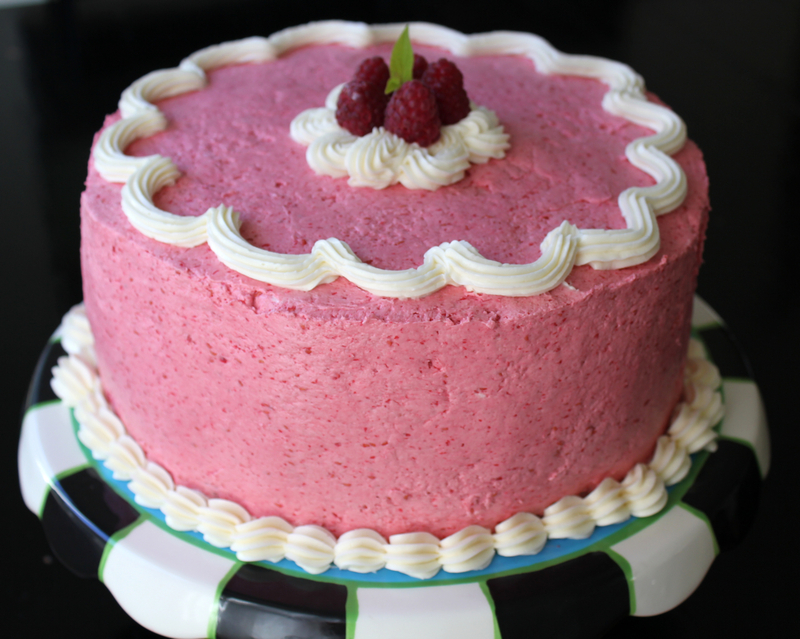 I made this cake for a friend’s birthday – pink is her new favorite color, and raspberries are in season. So, I created Fresh Raspberry Buttercream for the event. The vivid pink color is due entirely to the dark red beautiful raspberries I used in the the buttercream. The technique is the same as for the the Swiss Meringue Buttercream from my Chocolate Sandwich Cookie, but with the addition of fresh pureed raspberries. For the cake, I’ve been in search of a really good yellow layer cake recipe for a while, and recently came across this recipe from Smitten Kitchen. It worked well, and I’ll reprint it here, with credit due. Preheat oven to 350°F. Prepare two 9-inch round cake pans and spray with baking spray with flour. Sift together flour, baking powder, baking soda, and salt in a medium bowl. In a large mixing bowl, beat butter and sugar in a large bowl at medium speed until pale and fluffy, then beat in vanilla. Add eggs 1 at a time, beating well and scraping down the bowl after each addition. At low speed, beat in buttermilk and flour mixture until just combined. Scrape down the sides of the bowl one more time. Spread batter evenly in cake pans, then rap pan on counter several times to eliminate air bubbles. Bake until golden and a wooden pick inserted in center of cake comes out clean, 35 to 40 minutes. Cool in pan on a rack 10 minutes, then run a knife around edge of pan. Invert onto rack, then cool completely, about 1 hour. In heatproof mixing bowl, mix egg whites, salt, and sugar. Heat over a water bath until the mixture reaches 140 degrees, being sure to constantly stir to prevent hot spots. The sugar will have dissolved in to the egg white by this time. Transfer bowl to mixer and, using whisk attachment, whisk on medium until it is fluffy and cooled to near room temp. It should be a soft marshmallow consistency. Switch to paddle attachment and add the butter, 2 TB at a time on medium speed. Continue to beat on medium until the buttercream is no longer curdled looking, but is smooth and makes a “whapping” sound. Reserve a small portion of the white buttercream to use for decoration, if desired. With mixer on low speed, pour in the raspberry puree to blend with the buttercream. It should turn vivid pink. I didn’t strain the seeds out of my puree, but you could if you want a smoother buttercream. Assembly: Place one cake layer on a cake plate or pedestal stand. 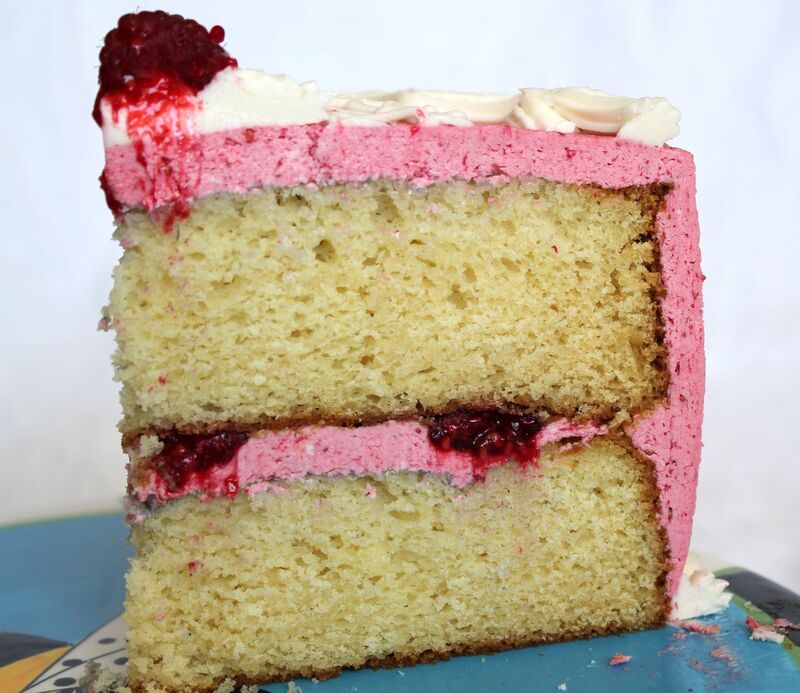 Spread some of the raspberry buttercream on the bottom cake layer. Dot with remaining whole raspberries. Place second layer on top. Frost with remaining raspberry buttercream. Decorate with reserved white buttercream, and whole raspberries, if desired. YUM!!! And it’s gorgeous, too! Pretty darn delicious and pretty darn pretty too! My little girl is turning five this weekend and she really wants a raspberry cake. After searching the internet and looking at multiple photos, she choose this one for her birthday! Thanks for the recipe and yummy picture. Thanks for letting me know! I hope your daughter loves her cake.